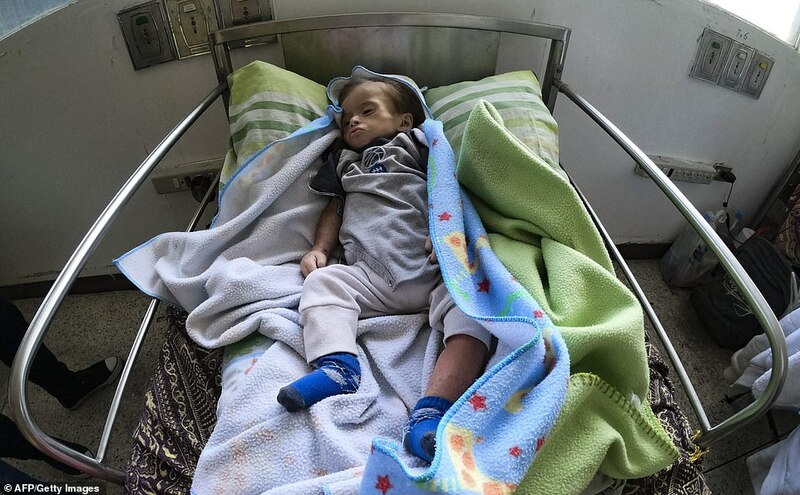 As President Nicolas Maduro stages the biggest military drills in Venezuela’s history, and steadfastly maintains a border blockade that is stopping humanitarian aid from entering the country, thousands of children are wasting away and starving to death. Heartbreaking images show young children being brought to crisis-hit hospitals resembling ‘little bones wrapped in skin’ by desperate parents unable to find food for their families. 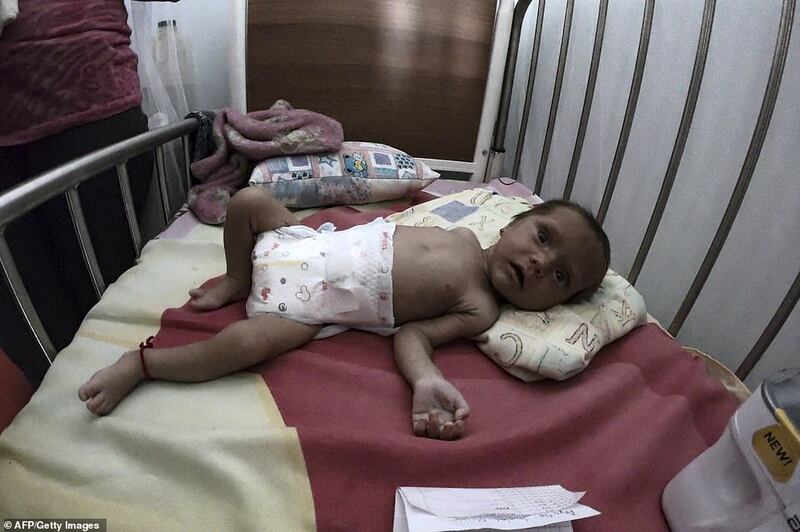 Eight in ten Venezuelan children are at risk of malnutrition due to staggering hyperinflation, which has left a can of milk for newborns costing as much as 70,000 bolivar. This is nearly four times the monthly minimum wage in Venezuela, and using the most recent exchange rate, 70,000 Venezuelan bolivar amounts to about 20p, or 30 US cents. 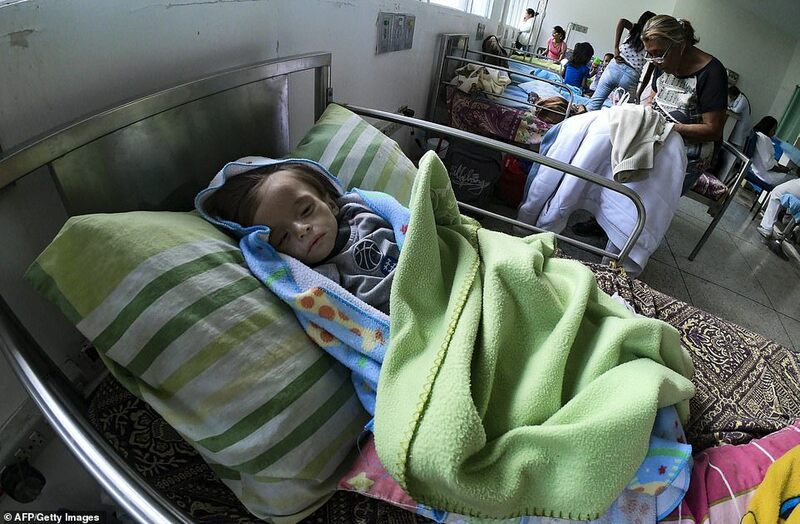 Despite having the world’s largest oil reserves, Venezuela is suffering soaring levels of malnutrition, disease and violence after 20 years of socialist rule launched by the late President Hugo Chavez. Opposition leader Juan Guaido has won backing from nearly 50 countries worldwide, including the United States, which has pledged an initial $20 million in support and has already shipped emergency food and medicine to the Colombian border city of Cucuta, where it sits in a warehouse. 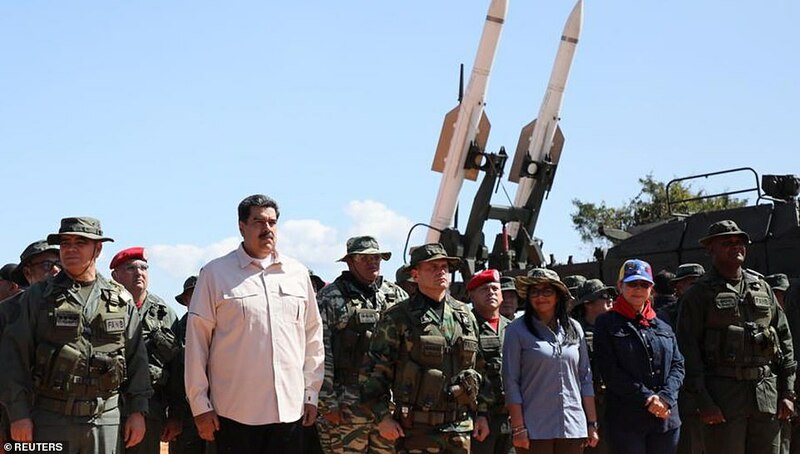 Maduro has refused all economic assistance, denying there is an crisis in Venezuela – and claiming that the aid waiting in Cucuta is part of a coup being orchestrated by the White House to topple him. 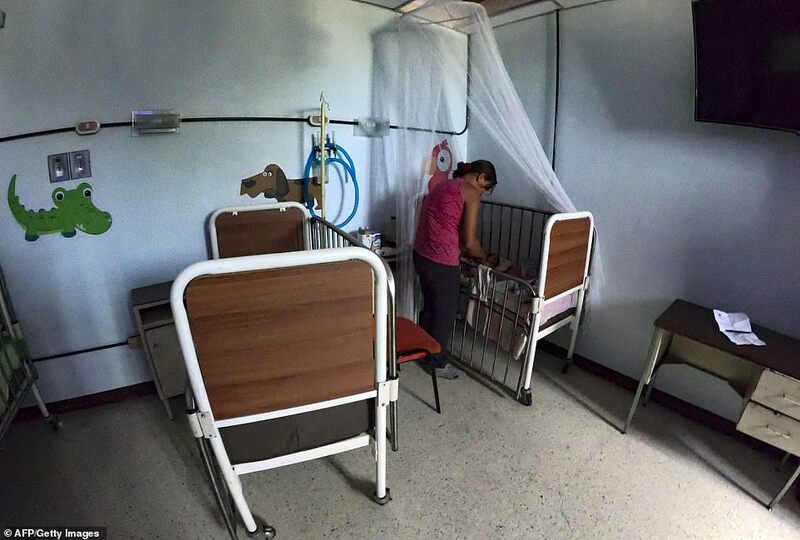 At a pediatric hospital called Los Samanes, in the city of Maracay, about 62miles from the capital Caracas, Yemilay Olivar holds her two-month-old baby girl Rosmilay. 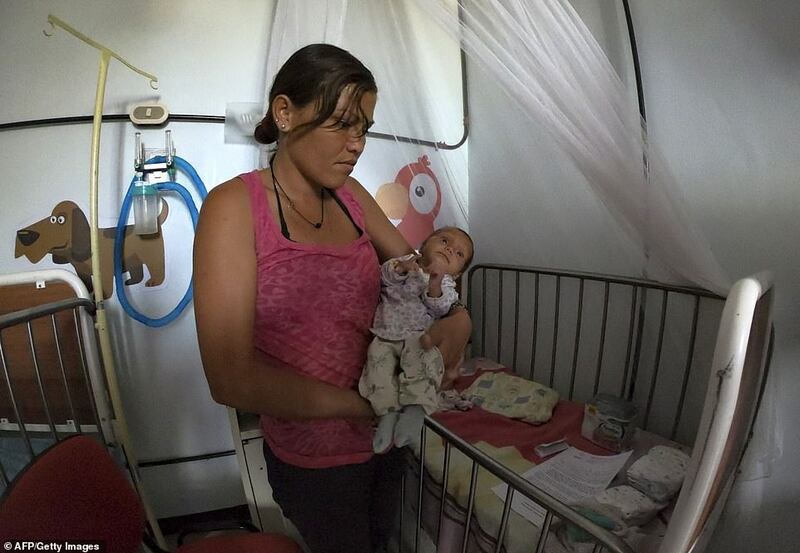 Mrs Olivar trudged nearly ten miles in worn-out shoes to bring her malnourished baby to the hospital, and left another six hungry children at home. Little Rosmilay should weigh around 11lbs, but tips the scales at just half that, and this is 200 grams (0.4lbs) less than at birth. The child’s skin adheres so tightly to the bone that it was hard to carry out intravenous feeding. ‘They could not find a vein,’ 29-year-old Yemilay, looking downcast and unhealthy. Elder, a pediatrician with 32 years of experience who asked that her last name be given for fear of repercussions, says she cannot recall seeing children in such bad shape. ‘Children come in with their little bones wrapped in skin. It is shocking to see,’ Elder told AFP at the hospital. Samuel, who is 15 months old, weighs as little as a newborn. His mother Gleiny Hernandez cries as she looks at him in a bed in the city’s Central Hospital, where he was close to death upon admission. ‘They did not want to treat him because they thought he was dead on arrival,’ said 26-year-old Hernandez, who recently gave birth to another child. Samuel’s head stands out grotesquely because his little body is so emaciated. He barely moves and stares off at nothing. During 15 days of hospitalization, his weight has increased from 7.9lbs to 8.5lbs. Even the ten-storey hospital itself is a basket case. The floors are filthy, the elevator does not work and in many rooms there are signs warning there is no running water. ‘There are doctors who have fainted from not eating,’ an anesthesiologist with 20 years of experience told AFP. 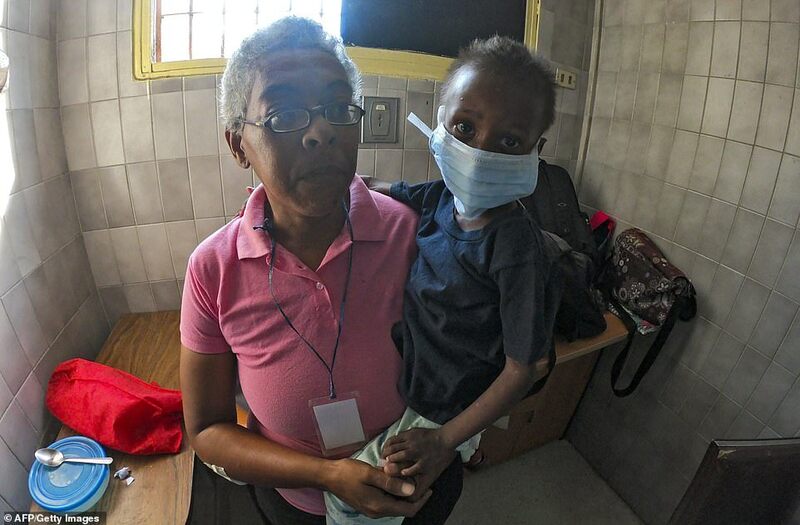 ‘It is all so exasperating,’ said Grismely Morillo, a resident in internal medicine, who cries over what she describes as the utter chaos at the hospital. Of the 15 to 20 children treated daily in the pediatric ward of the Central Hospital, 60 to 70 per cent show some degree of malnutrition, hospital sources said. 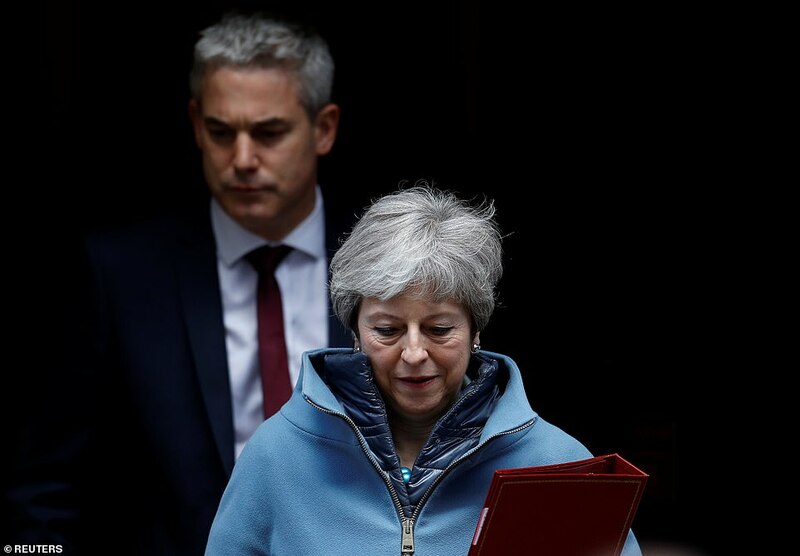 A study by the Catholic charity Caritas published in November revealed that 57 percent of the 4,103 children under five who were treated there had some kind of malnutrition and it was severed in 7.3 per cent of cases. In an old house in downtown Maracay that used to be a casino, the walls are now covered with children’s drawings. ‘Bienvenidos’ – welcome – is spelled out in colored letters in a room where children learn to read and write. The house is now a school for some 20 children and works as part of a foundation called Kapuy. It was created four years ago by Daniela Olmos, a 32-year-old doctor’s assistant, when she returned to Venezuela from the United States. 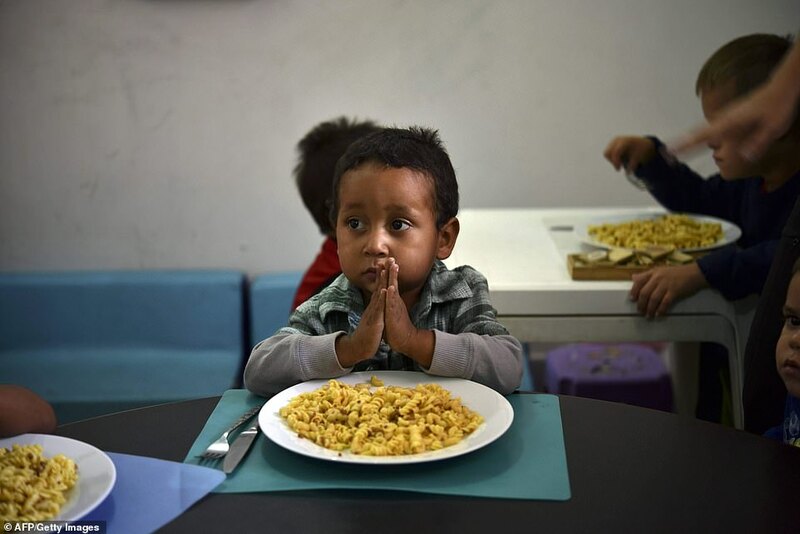 The opposition-controlled National Assembly says Venezuela is in the grips of a food emergency, the consequences of which include a growth delay in 33 per cent of poor children up to two years of age. Overwhelmed by the crisis, Mayerlin Diaz, who has seven children , one of them with Down syndrome, used to look for food in garbage cans or beg in the street for money. The Kapuy foundation rescued her from that life. ‘Thanks to them, my children eat three meals a day. 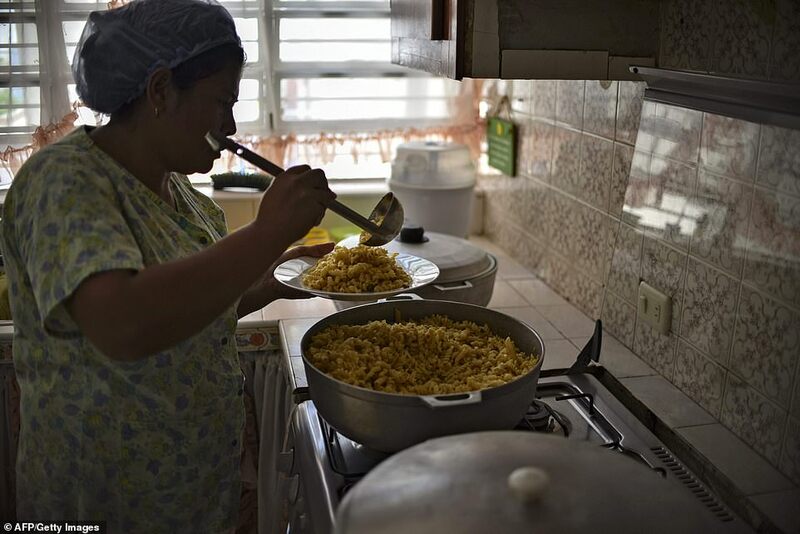 I have a job here,’ said Diaz, who said that from the government she gets a monthly voucher that does not even buy her a kilo of rice. Hundreds of thousands of Venezuelans took to the streets on Tuesday to demand the desperately needed humanitarian aid to be let in and for hated dictator Nicolas Maduro get out. Grandmothers, grandfathers, parents with small children and all other kinds of ordinary citizens answered opposition leader Juan Guaidó to demand international help and political change. 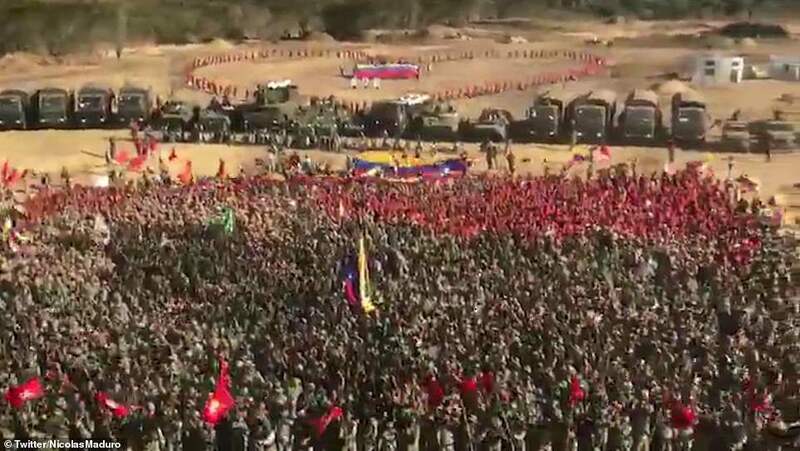 Huge marches took place in towns and cities across this once-wealthy oil-rich state calling for Maduro step down and the much-needed international aid stockpiled on the border be let in. The biggest demonstration was in the capital Caracas where self-appointed Transitional President Guaido attended a raucous rally. The huge crowd chanted ‘Liberty’, ‘Yes We Can’ and ‘Maduro leave’ as they waited for the opposition leader to arrive. They also screamed insults about Maduro’s mother. Ten-metre tall banners bearing the words ‘Humanitarian Aid’ were set up at the rally in the middle-class district of Chacao. Meanwhile demonstrators told how they had been forced on to the streets by the crippling economic situation. Fernando Rivero, 62, said: ‘I am here for my children and grandchildren, for a better future for Venezuela. 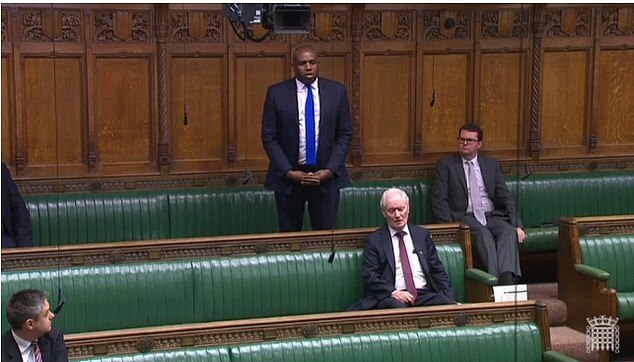 ‘We want all the people who have had to leave the country to come back home. Eva Anato, 48, said: ‘We can no longer make ends meet. Amid a carnival atmosphere the crowd danced and sang along to opposition songs. They screamed their disapproval and booed as speakers listed the Maduro governments many failings – corruption, economic incompetence and brutality. But the Demonstrators saved their voices for Venezuela’s leader-in-waiting, letting out deafening cries of support as the interim president Juan Guaido took to the stage.